oldshutterhand (Homepage) wrote: Strange scratch on the sky. Lovely shot. omar (Homepage) wrote: Perfect. Full of atmo! ben (Homepage) wrote: wonderful image, like the soft colors and the view. 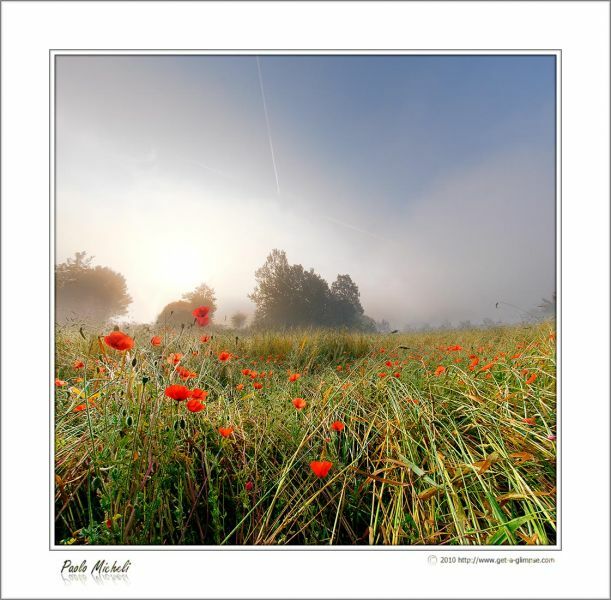 Andrés (Homepage) wrote: Love the poppy flowers here and the mist too. Joanna (Homepage) wrote: Oh, I love these poppies in the foreground, the grass must've been really tall. Well done. sherri (Homepage) wrote: Morning mist always has such a fresh feeling. Nice low angle. BoB (Homepage) wrote: Mi piacciono i fusti d'erba inclinati in primo piano, sembra vogliano invitarti ad addentrarti in questo bellissimo campo. Marcie (Homepage) wrote: Oh..this is absolutely magical. Love your point-of-view and framing. John Maslowski (Homepage) wrote: Beautiful ambiance, really like the low angle view that captures a great foreground of tall grasses and lovely flowers. Like the mist and sunlight that creates the mood in this shot. Excellent work! buntagphoto (Homepage) wrote: Magical moment. Jacob S. Jensen (Homepage) wrote: This one is nice :-) Great light, great atmosphere! Frida (Homepage) wrote: Beautiful morning!